Raising adventurous young eaters can be exciting or daunting, depending on the child. And if you have more than one child, there is no expectation that they’ll love the same things. In fact, on some days it seems the only thing my two kids have in common is that they eat. 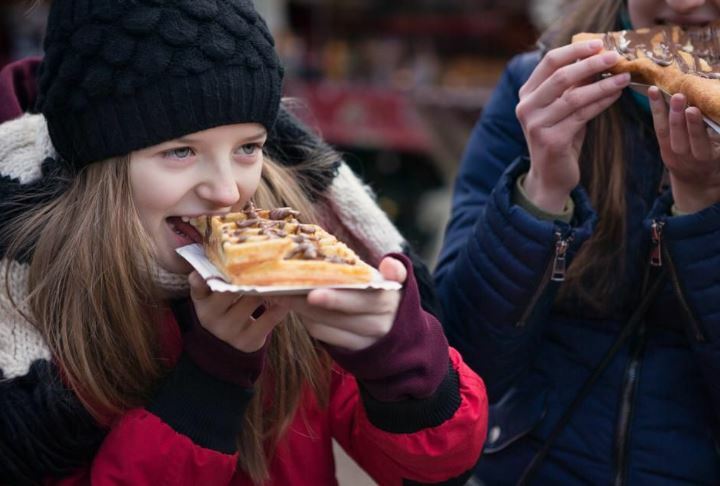 When we travel, we love sampling the local cuisine and finding culinary tours that allow children or visiting local food festivals can be a great way to introduce them to several dishes in a short amount of time. Food for our family is more than sustenance. We rarely dine at restaurants chains simply because we prefer to support local, independent restaurants and also because you can enjoy local cuisine at local joints. Whenever we travel, we often ask locals where they like the eat because who better to advise you on the best places than those who live there? In the absence of a local, or if you’re short on time but still want to experience all a city has to offer, consider a culinary tour. it’s a social experience which can be fun, too. While some culinary tours are meant for adults only, there are plenty that either cater to or welcome children. Does your child prefer to watch Top Chef instead of SpongeBob? City Food Tours in New York Cities offers In the Steps of a Top Chef tour which welcomes children as young as 11 to participate in the three-hour tour that includes participating in an interactive challenge, learning how to use a variety of knives and enjoying a snack at one of Tom Colicchio’s eateries. In Miami, the Miami Culinary Tours is a local company forged with a team of knowledgeable and passionate foodies guiding popular Miami food tours. During the Little Havana Food and Culture Tour, participants can enjoy tasting Cuban cuisine while learning the stories behind those doing the cooking. Throughout the tour, guests will also learn about the spiritual beliefs the community practices and stops include Domino Park and The Cuba Ocho Art Museum. Not all culinary tours are located in big cities. In Naperville, Illinois, a city about 30 miles southwest of Chicago, visitors can opt to take a culinary and cultural walking tour through its charming and historic downtown and nearby towns through Naperville Food Tours. While it’s only available from April through November, the tour is a nice way to combine history, architectural, culture and local cuisine within a three-hour window. Many of us recognize the importance of food during our travels but knowing where to go can be difficult to navigate in a city with many options. Culinary tours sometimes take the joy out of stumbling upon a great little place or trying something you’d never heard of but since tour guides often are locals and the tours work with places in advance, we often get exclusive epicurean adventures while stopping at some of the best restaurants a city has to offer for tastings at each stop. And, in many cases, the tour organizers take special consideration of the stops, making sure the places welcome adventurous young food lovers. In other cities, local festivals are a fun way to get the local flavor and since there are often many kiosks with different types of food, kids can be more selective with their options. Whether you’re visiting bigger cities like New York City or Miami, or cities a bit off-the-beaten-path like Naperville, why not seek out the culinary tours offered or find the local food fests to explore. And don’t be afraid to bring the kids along.